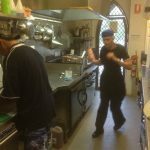 St. John’s Drop-In Centre is a welcoming place, for those in need of some hot food or seeking refuge off the streets – to have company in a warm and friendly environment. 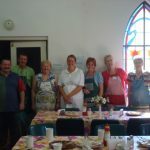 The Centre is open for lunch Monday to Friday, 11.30am to 12.30pm and Saturday breakfast from 7.30am to 8.30am, cooked by our loving and dedicated volunteers. 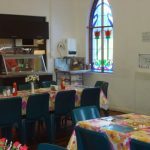 While a hot meal is provided at these times, sandwiches and fruit are available at the weekday lunches to take away for an evening meal. Lunch is $3.00 per meal. Clients can also have a hot shower, wash and dry their clothing, and use the bathroom facilities provided which are opened from 9.00am to 12.pm. We offer a safe and dignified environment in which clients can access various organisations for help including the HHOT Team (Homeless health Outreach Team), Centrelink, Gold Coast Homelessness Hub, Gold Coast Youth Service, Orange Sky, Uniting Care Community – Financial Counsellor, OZ Care Representatives, Hair Dressers, Podiatrist, Dental Appointments and Narcotics Anonymous who meet 3 times a week on our premises. St. John’s Drop-in Centre is proudly funded by the Department of Housing and Public Works.